After four games without a win, Leicester opening up an eight point gap at the top of the table and worst of all for Gooners – tottenham overtaking us in the league – it was high time Arsene Wenger got his troops back to winning ways. Mission accomplished was the epitome of this 2-0 performance, as the Gunners performed in fits and bursts but in the end did just enough to get back to London with three points and the focus now falls on next weekend as top of the table Foxes travel to The Emirates. There were changes afoot in the Arsenal team – and after the frustrating display midweek against Southampton, these were necessary. They weren’t the changes Gooners expected however. Mathieu Flamini and Aaron Ramsey didn’t cover themselves in glory during that game but they held their place down. Mohamed Elneny wasn’t included in the squad as his wife had just given birth and Arsene Wenger was picking carefully as Francis Coquelin stayed on the bench. The Frenchman’s fitness is vital to Arsenal’s cause and the fact he remained on the bench was indicative of how important Wenger rates him. The other change was Alex Oxlade-Chamberlain replacing Joel Campbell. The Costa Rican hadn’t put a foot wrong in his displays and had proved dependable when needed, but with a goal drought within Arsenal’s ranks, it may have been Arsene Wenger looking for more of a goal threat. Seeing as Oxlade-Chamberlain had NEVER scored an away goal for the Gunners, the decision may have haunted Wenger. Benik Afobe – the former Arsenal man who was now at the Cherries via MK Dons and Wolves – started the game and the match was steady enough in the initial stages, until Mathieu Flamini decided he wanted the ball a little too much and his two footed challenge may have merited a straight red card. Thanks to the Frenchman’s early reactions it meant he got the ball and was nowhere near to injuring the Bournemouth man, but an early booking for the fiery midfielder could have hampered Arsenal’s efforts. Arsenal were easing themselves into the game and on the twenty ninth minute, the deadlock and drought was ended. A lofted ball into the box by an improving Aaron Ramsey was met by Olivier Giroud’s clever header back into the centre of the box. A lurking Mesut Ozil met the bouncing ball with a lashed volley which hit the net high and gave Artur Boruc nothing but air to grasp. It was a great finish and our away fans were singing proudly, but merely ninety seconds later, Arsenal were two to the good. Steve Cook in the Bournemouth defence didn’t effectively clear away an attempted through ball and the ball squirmed to Aaron Ramsey. The Welshman took it forward a few yards before playing a ball into the box for an onrushing Oxlade-Chamberlain. The England man’s touch took him a little wide but his drilled finish was emphatic and precise. 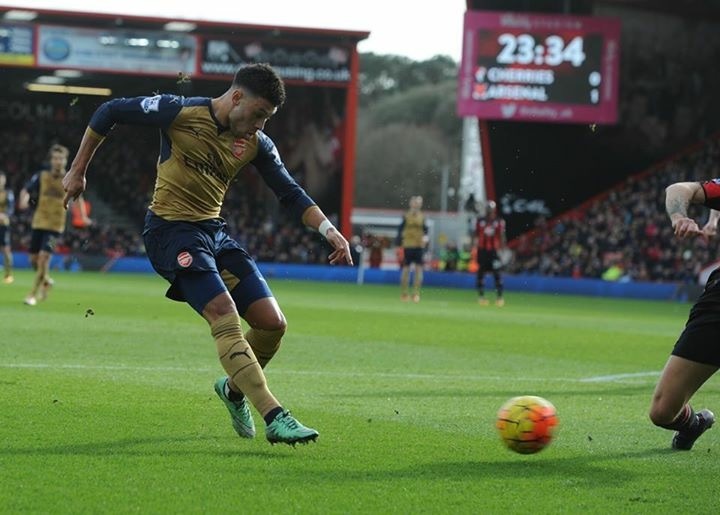 A first away goal for The Ox. Ramsey looking the part once again. 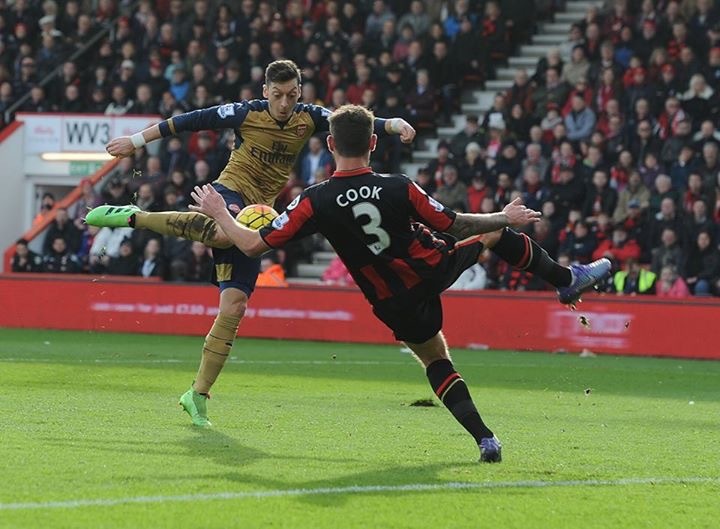 Ozil the danger man once again. Arsenal were looking good. There were a few chances but in all honesty, Arsenal saw out the half in comfort. Comfort which had been at a premium in the last month or so for Gooners. If the first half was Arsenal’s, then the second half belonged to the Cherries. Repeated attempts on goal were the order of the day, but thankfully for the Gunners, Bournemouth’s shooting boots were left at home. Matt Ritchie in particular was erroneous in his finishing, with all five of his attempts failing to find the target. 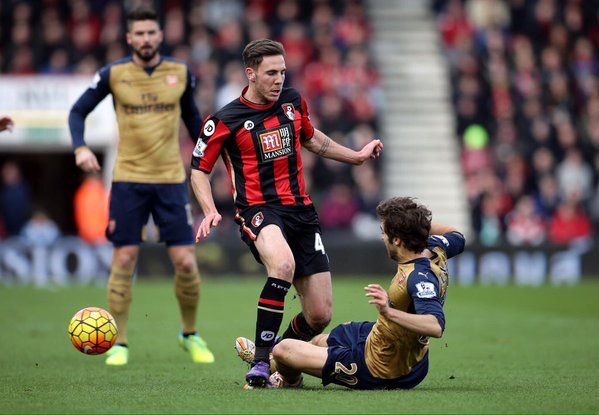 Was it simply Bournemouth coming out for the second half with renewed vigour? Or was it down to Arsenal allowing the home side to attack? Any spectator could see from some distance that the Gunners were less intent on attacking and more focused on clamming up the Cherries channels, but the Gunners had opportunities to finish the game. Unfortunately though, the game began to peter out and Alexis Sanchez seemed to run out of the steam which normally propels him so well. The Chilean was subbed, as was Oxlade-Chamberlain, with Walcott and Coquelin being the replacements, but that was the highlight of the second half. Eddie Howe had his side playing some nice football, and the build up play was effective as well as aesthitically pleasing, but the end product was lacking. Some of this may have been down to Arsenal’s defence, but it speaks volumes that Benik Afobe had no shots to speak of. 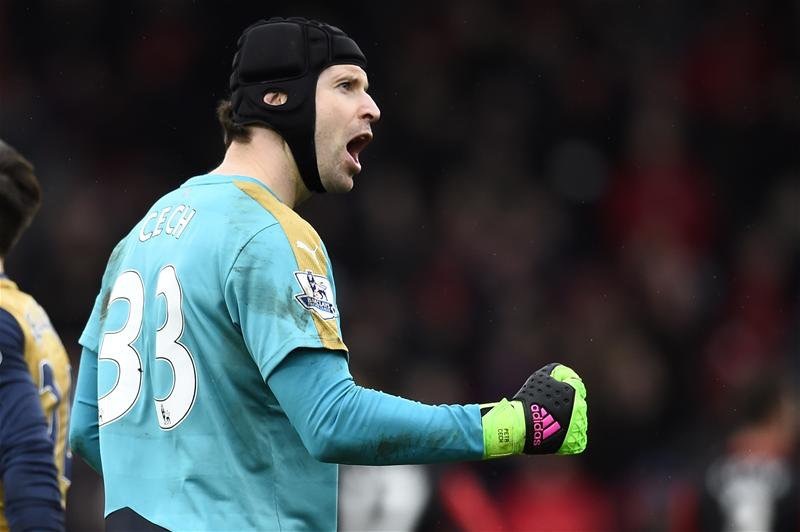 Bournemouth came closest in stoppage time, with Petr Cech proving himself more than equal with a double save of real quality. He had been called into action before this but these two saves were the pinnacle of his own personal highlights reel. The Czech keeper had earned his clean sheet bonus. Kevin Friend, the match referee, blew for full time and Arsenal had limped over the line after exerting all their efforts in the first half. It was slightly disconcerting that our team looked so exhausted at times in the second half, but they did the job that was needed. Bournemouth had seventeen efforts to shout about, but only five were on target. They possess the skills to stay away from the relegation parapet but they must improve on their last third presence if they are to make full use of their possession. Meanwhile, Arsenal have got back to winning ways and now look to a match against surprise leaders and title favourites Leicester City. Thanks to the sketchy results recently, it is the epitome of a must win game if the Gunners are to claw back to top spot. Not only that, our neighbours are getting a little louder, so a win will quell their uprising a little. Three points in the bag, and Coquelin inches his way to full fitness. Nothing but positives!!! 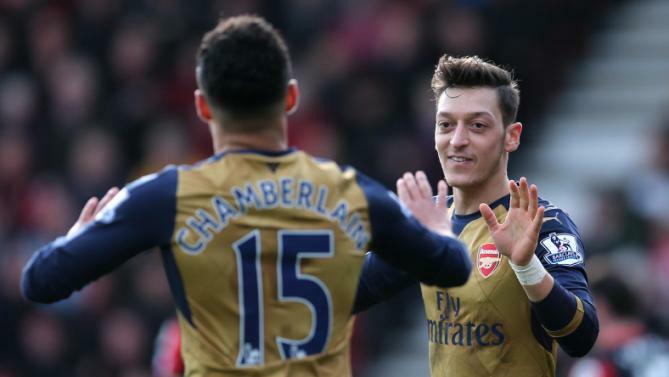 Crunch Time Coming Up for Arsenal against Leicester City. Yet another bad performance by this current Arsenal team (and I use the word team loosely)..Flamini and Ramsey together?? only a moron can’t see that fails every time.. Giroud..some decent hold up play but apart from that he looked like a statue..the BFG looks rapid compared to that display..Ozil was good and the back 4 were ok in the first half..the fact that Bournmouth were useless at shooting underlines the fact that without Cech making 3 or 4 excellent saves..we would have lost to a very moderate team once again.. meaning that we were complete rubbish all over the pitch in the second half.